College bound high school students. Students at Los Arboles Middle School in the school halls moving to their next class. Monterey High School students prepping for a sporting event. Elementary school students engaged in classroom learning. Superintendent Dr. PK Diffenbaugh engaging with students at Back-to-School Night at Seaside Middle School. Middle school students collaborating on an assignment. Middle school students enjoying lunch break. Seaside High School staff during the Homecoming Parade. The Monterey Peninsula Unified School District is pleased to welcome new and returning students and families to 2018-19 school year. There are so many exciting things occurring at MPUSD, and I hope you and your family are ready for the incredible year ahead. We ended last school year on a high note with the passage of Measure I, the $213 million school facilities bond, which allows us to provide critical repairs for 21st century classrooms. Thank you for supporting Measure I, and for your continued confidence in the district, your child’s school, our teachers and staff to prepare your student for academic success. This summer was very productive. Many of our teachers and staff continued to build their capacity by participating in various professional development opportunities throughout June and July. We had approximately 18 school facilities projects underway that will enhance your child’s learning experience. Our committed team of teachers, staff, and administrators have an outstanding year planned. We continue the rollout of our Reimagining Secondary Teaching and Learning Initiative, which features International Baccalaureate in our Monterey community, Project-Based Learning and NewTech Network in our Seaside community, Early College and Career in our Marina Community. We also have a strong system of social and emotional supports in place that features support staff at all school sites. We will continue Positive Behavioral Interventions and Supports, and enhance our Multi-Tiered Systems of Support that addresses all aspects of student learning, including academic, behavior and social and emotional issues. My Cabinet team and I will be visiting school sites regularly throughout the school year. We look forward to making a personal connection with you and your student, and partnering with families and the community to ensure every school and every student succeeds. If I can be of help to your family during the school year, please don’t hesitate to contact my office at 831.645.1200 or email to superintendententsmemo@mpusd.net. 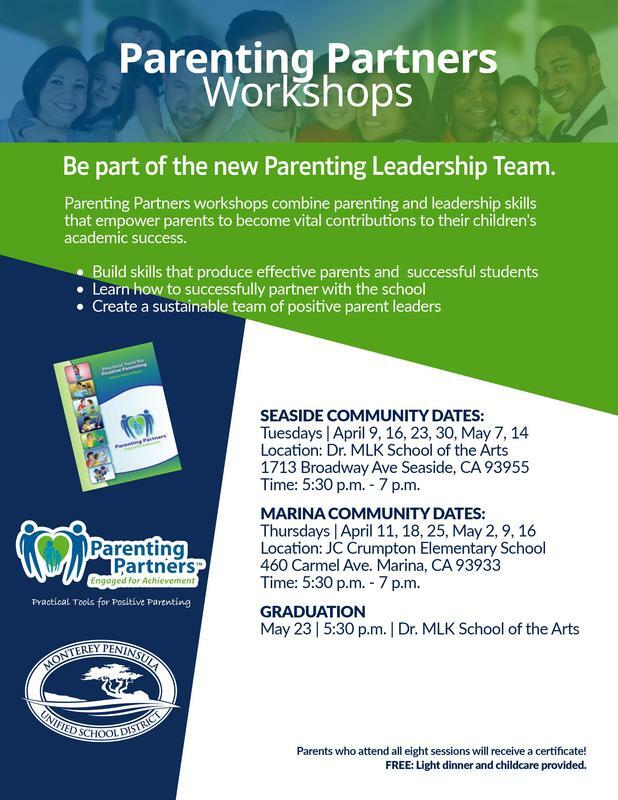 Parenting Partners workshops combine parenting and leadership skills that empower parents to become vital contributors to their children's academic success. You're invited to attend six workshops and graduate as a parent leader in MPUSD. 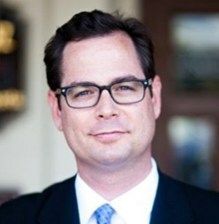 Can't make all in your learning community? Attend any dates, locations and times. 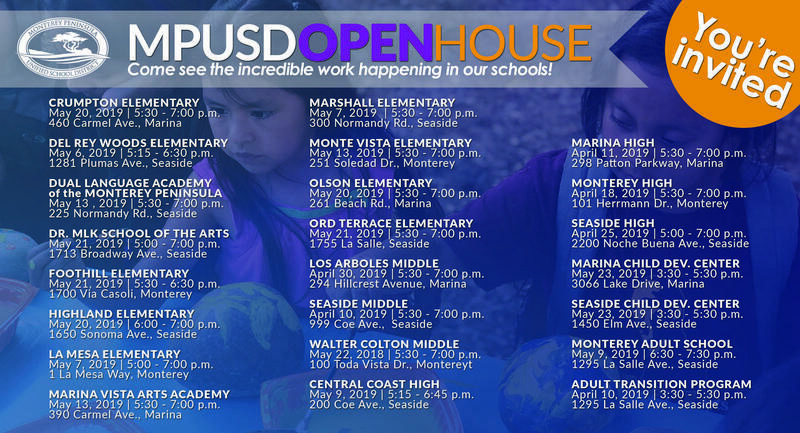 The community is invited to visit any and all MPUSD schools during Open House 2019. Mark your calendar! The dates and times are now available. We want to hear from you! The district provides opportunities for stakeholders to provide feedback on parental involvement activities and how you would like to see the district align and prioritize spending of its resources. 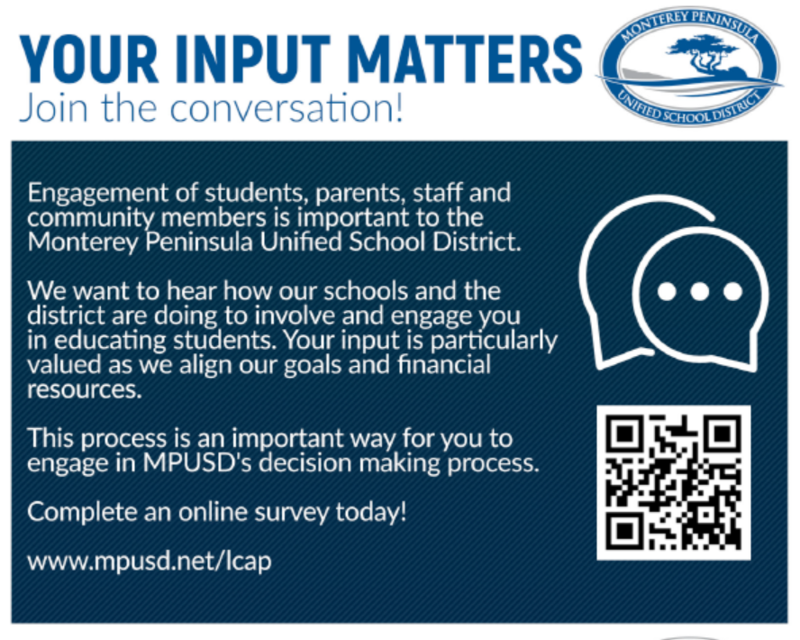 Take the brief online survey in English or Spanish today!